Instead of following advice from doctors who were telling her to restrict calories, eat meat, and take a weight-loss drug, Ashley Chong did the exact opposite. She went 100% raw vegan overnight and it changed her life. 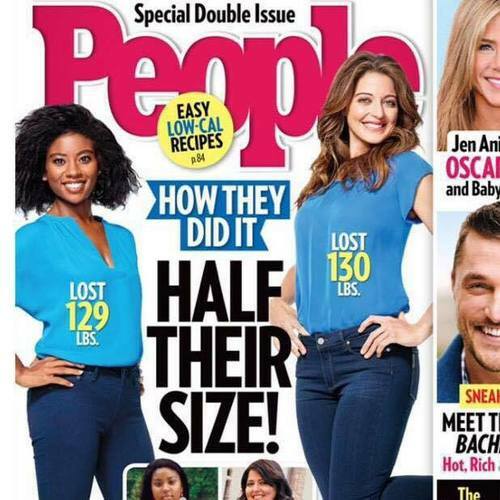 She ended up losing about 125 lbs in less than a year and overcome multiple health issues. 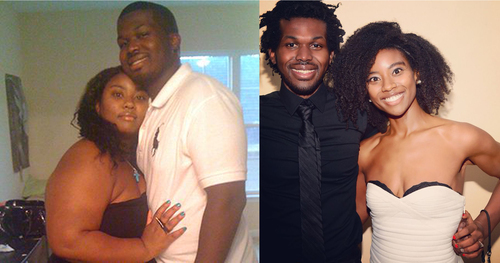 Read more to find out about Ashley’s amazing vegan transformation. If you asked ten people what “healthy” means you would probably get ten different answers. Healthy can mean a lot of different things to a lot of different people. Some would say being able to run a six minute mile is considered healthy, some would say just being able to eat, breath, and sleep is healthy. Some may even say as long as you are walking without holes in your chest then you are looked at a healthy human. We can all agree on one thing- that there are many definitions of the word. On a daily basis we see everything from fitness ads to pharmaceutical drugs that are supposed to get us “healthy,” but unfortunately none of these is the correct definition in the true sense of the word. Although I did not know it at the time, I, like thousands of other people, was in the dark. I was truly ignorant to what true health really was. All I knew was that I needed to change. I was obviously unhealthy and lacking any of the healthy attributes mentioned above. 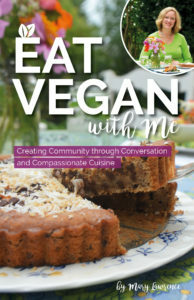 I looked into all avenues, but the word that turned my life upside down was the word “vegan.” As I started to release all apprehensions and open my mind, I started to understand that health was not only physical, but mental and spiritual as well. It was not make-up, pills, or surgery that eventually changed my life and way of thinking. I became a radiant and truly healthy human being by removing harmful substances from my body and replacing them with foods fit for consumption, and by increasing my overall consciousness. I became a vegan. Nowadays people call me an inspiration to many, but my story did not start out that way. I was opposite of the person I am today. At age 21, I was not so beautiful, glowing, truly happy, or any of the other words that people use to describe me now. I was 5’2 252lbs. I was tired with back pain and pre-diabetes, but of course that wasn’t enough for me to make a change. It was the beginning of the year 2012 and my sister had just gotten engaged and announced that her wedding would take place in September of the same year. “Great,” I thought, “not only do you want me to wear this hot pink dress, but you are also slamming the ceremony so close!” This did not give me much time. I couldn’t go stand by her as her bridesmaid looking tired, sick, and just not healthy. So, like previous times before, I started to exercise which honestly was nothing new to me. I had been an avid and competitive soccer player from the age of six to sixteen. I began to run daily, cut my calories, and also started taking a popular weight-loss drug called phentermine, prescribed to overweight people, which is supposed to cut the appetite. I did two weeks of counting every single calorie and popping those pills until something clicked. I could not do this forever, no one can. “Forget this doctor,” I thought, so I began to research. I read many books written by doctors and holistic nutritionists. I also scoured the internet almost every day. My research findings were insane. 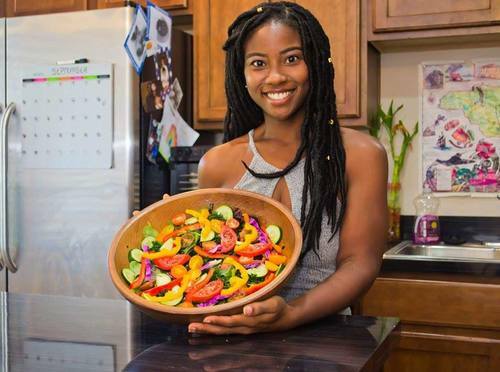 I kept coming back to the words “raw,” “vegan,” and “plant-based.” I found so much documentation of people who were not only losing weight, but also completely thriving on this lifestyle. They seemed to be glowing and fit, free of disease and fatigue. Truly healthy, I thought. I must give it a try. I literally dove straight in. I threw away all my pills and that very inconvenient notebook where I had been counting all my calories in. I found that the Standard American Diet was the number one cause of obesity, heart disease, and cancer. “Why is this stuff legal?,” I pondered. First step was to remove every single thing that I was putting into my body that was causing it harm, and although I had always been a devoted believer that I needed to eat meat for protein, it meant taking away all animal flesh and bi-products such as milk, cheese, eggs, etc. This meant I had to remove overly processed and genetically modified food-like products out of my diet as well. I found that these items were detrimental to the human body, to my body, so it wasn’t a debate. I quickly trashed them and began my journey. As I was still researching about nutrition and the human body, it started to make more and more sense that not only should one remove all things causing harm to the body, but one should also replace those food-like products with real food. Replace it with food that doesn’t cause the body’s immune system to weaken, allow it to contract diseases, or to become obese. I found that the best foods for the job had to be 100% raw fruit, vegetables, and leafy greens all in their most natural state, the way they were intended to be eaten. I started getting as much of this real food into my system as possible. I went raw vegan overnight. I started experimenting with raw food meals, smoothies, and juices. Not only did I learn about the benefits of raw/living food, but I began to experience them for myself. Food is meant to nurture, fuel, and heal the human body and that is what I started to do. I was losing fat rapidly, my skin started to get clearer, hives disappeared, and my back magically stopped hurting. Although all of that was absolutely fantastic, what really started to change was how I felt and my way of thinking. It started to become less and less about weight-loss and more about the inhumane treatment of animals, the health of the people around me, and the health of the environment that I lived in. I was eleven months into my journey when I realized that I had lost over a hundred pounds. I was thrilled. Yes, but that wasn’t the end. I started to become conscious of everything. Everything from what I put into or on my body, to what I allowed myself to listen to or watch on tv. It made me realize that all of this suffering from obesity, lethargy, and type two diabetes could be prevented. I started to heavily encourage others to become vegan not only for the status of their health but also for the health of our planet and animal equality as well. Being on this wonderful journey has made me realize that being healthy isn’t just about how you look on the outside but also how you feel and how you act towards others. The beauty was there physically, mentally, and spiritually. I fed my body well. I felt absolutely amazing; I treated others and the environment with kindness. I became healthy and radiant. RawandRadiant as they like to call me. 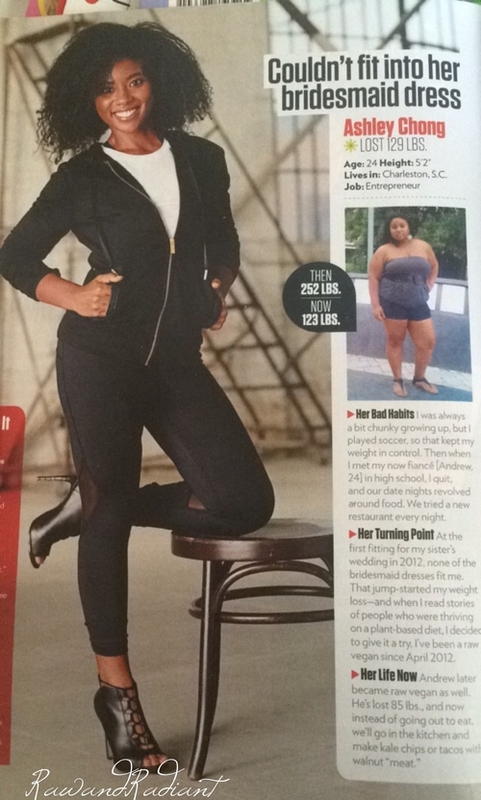 Ashley’s weight-loss story has been recognized and shared a multitude of times over various social media platforms such as ForksOverKnives.com, Mercy for Animals, BlackWomenLosingWeight.com, and so much more. 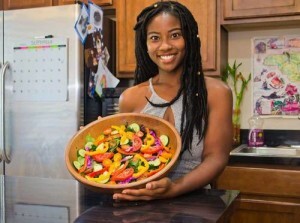 You can learn more about her and her recipes on her Rawandradiant website. I loved reading about your journey to good health via a vegan lifestyle. You truly are glowing and animals are living because you and so many others are choosing not to eat them. Thank you for sharing your story. Amazing story…thank you for sharing. Do you eat beans, legumes and if so do you cook them? Your story is amazing! Great job? Hey Rachel, im a SDA too all my life and I have always been a vegetarian and I became vegan for over a year and then fell off the wagon but I need to get back on it because vegan is the way to be truly healthy! I found this story inspiring too and it has encouraged me to be vegan again. I am also SDA. This is a great story. It gives me courage to take the leap and go raw in the coming months. Spring is a wonderful time of the year to eat more salad and other raw delicacies. I am duly impressed how this young lady became a vegan. She is indeed radiant. They actually make vegan ice cream and chocolate and i’m sure they have come up with some vegan cake as well lol. personally i am not a vegan but i have tried them and they are delicious. try ice cream made from rice milk, that is a personal favorite of mine. Delicious raw protein powder add fruit like berries and coconut yoghurt frozen or raw greens or add green powder with wheat grass spirulina chlorella etc coconut water ice. Anything else you might like delicious makes you feel full. Also i make cacao protein raw balls or slices. So many delicious recipes on line. Raw chocolate you can make yourself. Conquers the sweet cravings in a healthy manner. Wow….truly inspirational…..!! 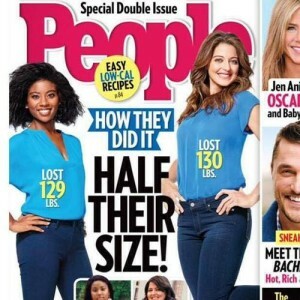 This is testimony to others that its far more simple (not easy necessarily) but simple to lose weight. Great story and encouragement to others. Fall into place. I pray and pray for the peace that all these raw vegans have so I’m grateful to have enough strength to try it. It makes sense! If you want your life to be…well…vibrant, why would you stuff your body with literal death? Bring vibrance and life into your body. Not just for weight loss but because you deserve it! I’m so so so grateful I found this story. I will report back on my own personal progress soon. God bless all!